As a part of the Fiction Addiction Book Tour for author Nick Alexander, I didn’t just receive the chance to review his novel ‘The Half-Life of Hannah’, but also the sequel ‘Other Halves’ which will be published by Black & White on the 5th of June. I found myself really looking forward to being able to go back to the same cast of characters, curious to find out what had happened to them after the end of the first part, and I hoped I would enjoy the book as much as I enjoyed ‘The Half-Life of Hannah’. After a not so successful holiday in the south of France, it is clear that Hannah and Cliff’s marriage is over. Hannah is back together with the love of her life, Cliff’s brother James, and wants to start a new part of her life with him. However, her marriage to Cliff lasted fifteen years and resulted in their wonderful son Luke, and Hannah quickly realises it might not be as easy as she thought to cut the ties and start over again. The separation forces both Hannah and Cliff to rethink their decisions and once and for all decide what it is they want in life. 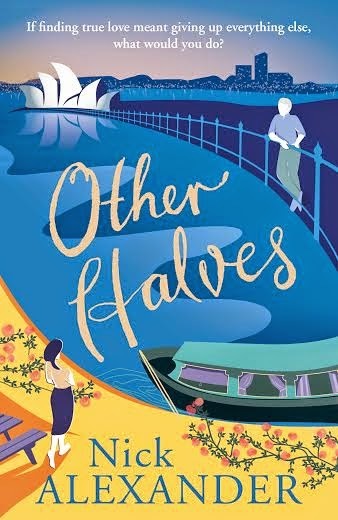 ‘Other Halves’ is the second part of Hannah and Cliff's story and I’m personally really happy the author decided to write a sequel. It felt like the characters had much more to tell, and this book shows that is indeed the case. I really enjoyed that Cliff got his own voice in this story, much more than in the first part. The reader gets to see everything from both Hannah’s and Cliff’s perspective which really added another layer to the story. In the first book, I was definitely rooting for Hannah, while the sequel also shows you Cliff’s perspective on it all and I couldn’t help but feel for him as well. It was wonderful to see these two characters develop and trying to find their own way after their marriage has ended. As the reader I found myself stuck in the middle of the divorce as well, in a way, and Nick Alexander did an amazing job conveying this feeling onto paper, making this a rather emotional read. After finishing ‘The Half-Life of Hannah’ I first read some other books before starting this one. It was really easy to get back into the story, and I guess you could also read it as a stand-alone, though I don’t recommend it. The first book centres on an important part of Cliff and Hannah’s story, and the two books together make a strong whole and complement one another. The story and the characters are incredibly real, and it made me think about how my own life has turned out because of the decisions I’ve made. ‘Other Halves’ is a wonderful sequel within this realistic, gripping and emotional series; definitely recommended! For more information about this book: Amazon.co.uk / Amazon.com/ Goodreads Thanks to the author for providing me with a review copy in exchange for an honest review. Be sure to enter the giveaway to win a paperback copy of both books, open internationally. Good luck to everyone! Thank you for reviewing both of Nick's novels on tour today Jody! Shaz, thanks so much for stopping by and leaving a comment! :) You're very welcome, thank you for organising the tour and letting me be a part of it! I recently read about the author via his Twitter and was impressed of his journey into the publishing world. I def look forward to getting my eyes on reading his work. A to Z Book Survey! The Book Blogger 'Get To Know Me' Tag!